Notes: See Jeremiah Codswallop in the trailer here. On December 26 & 27, 2015, Jeremiah murdered Grumpy Old Harrison Ford and The Fez, respectively. However, he got away with both murders after tripping up the audience investigation both nights. Jeremiah Codswallop is a prospector who has spent the better part of a lifetime traversing the American West in search of gold. Despite his persistence, he has yet to strike it rich. 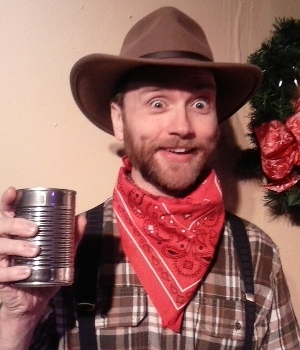 Too much time alone in the wilderness with only his mule, Beatrice, and a seemingly endless supply of canned beans to keep him company has perhaps left Jeremiah a little loopy, but his dedication to his dream is something we can all admire. In 2018, Jeremiah revealed that he is in a relationship with Queen Victoria, a girlfriend he made out of a cactus.